Greer Firestone: A Sea Change at DTC with "The Outgoing Tide"
The times they are a changin' at Delaware Theater Company. Bud Martin, the new Producing Artistic Director, has transfused the 3 decades old institution with game changing steroids. 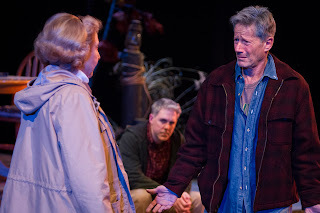 .While Michael Learned of “The Waltons” fame may be the biggest name of the 3 person show, this is Strauss' show playing Gunner, a husband and father who has hatched an unorthodox plan to secure his family's future. The idea is met with much consternation by his wife (Peg) and grown son, Jack (Ian Lithgow). Interspersing dark humor with pathos, one is not sure where we are headed in Act 1. The playwright's conceit was to switch scenes decades back to create familiarity with the family dynamic. Strauss, for example, went from a young father to a crotchety old man with Alzheimers. Peg was always the over protective mother. Jack (Lithgow) was an only child of a sarcastic, teasing and rough-edged father. The naïve son believed everything Dad said. Jack: Why didn't I have a brother or a sister? Gunner: You weren't the only kid. You were the only one we kept. We sold your two brothers to the circus. (At that point, Jack, as a child, starts crying). Gunner has a plan to tie up loose ends. He will commit suicide so that the family can collect double indemnity life insurance. Peg is outraged, but he demands her blessing before he can go forward in his last dinghy ride with his bottle of scotch. Are the ends tied? I will leave that for the future audiences. This is a difficult play, gut-wrenching and supremely acted. Note to director: as a father who at times has had his own strained relations with his son, boy... would I love to see a hug in the final scene. Next up is “A Christimas Carol”, then “Boeing Boeing” directed by consummate actor/director of UD Rep Ensemble Steve Tague. DTC's first full blown Broadway musical, “South Pacific” ends the season, directed by Bud Martin and choreographed by our local legend, Sonny Leo.